Set amongst the Redgum Trees , Overlooking the Murray River, Modern, Relaxed & Affordable Accommodation that’s what Murray Waters has to offer you. Located on the beautiful Murray River. Offering quality budget accommodation with a relaxing atmosphere boasting pool and river views from all rooms with a two minute walk to restaurants and shops and the main hub of Barham. 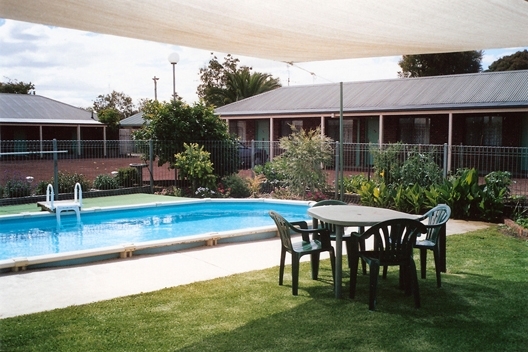 Modern, comfortable, well appointed motel with friendly country hospitality is what cluBarham motel is all about. Introducing Barham’s newest addition in luxury accommodation! Experience true luxury at Barham Golf Resort’s all new two bedroom, two bathroom self-contained units. Arch on Mellool compromises of two apartments with there own unique characteristics located in the Main Street of Barham. Your home may be your castle, but when you are travelling you need a home away from home without a royal price tag! Welcome to Koondrook Caravan Park in the historic red gum township of Koondrook. The park is situated on the junction of the Murray River and Gunbower Creek. cluBarham River Motel’s quiet location is a short walk to the Murray River, Riverside Park and Barham town centre. Fully self contained apartments. Undercover parking, full kitchen, bathroom & laundry. Private patio, onsite BBQ and solar heated salt water pool.